Dave Johnson was an athletic swingmen on some of the most highly rated Syracuse basketball teams of all time. He was an explosive jumper and a quick player, with decent size. Johnson came to Syracuse after playing one season of prep basketball at Maine Central Institute. As a freshman, his offensive skills were unpolished, with a rough outside shot. He was, however, and outstanding defender with this size and speed, so coach Jim Boeheim would rotate Johnson with junior sharpshooter Matt Roe, who was an outstanding perimeter shooter. Johnson would be the team's sixth man that season, a critical component as they made a run through the NCAA tournament (only to fall short in the elite eight). Johnson would earn a starting berth his sophomore season at the shooting guard, in the backcourt with senior Stephen Thompson. In the Big East/ACC challenge, Johnson would hit two free throws with time expiring to win the game over #1 ranked Duke. Thompson, however, was not effective at the point guard position, and would shift back to the shooting guard as freshman Michael Edwards took over the point guard position. With Derrick Coleman, Billy Owens, and LeRon Ellis up front, Johnson was the odd man out, and once again would resume his role as the team's sixth man. Johnson would have his breakout season his junior year, alongside teammate Owens. With Coleman and Thompson graduating, both players would assume bigger roles. 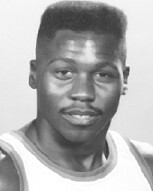 Johnson, who had been a defensive substitute much of his first two seasons because of shooting deficiencies ironically had developed into the team's top three point shooter. He and Owens would help lead Syracuse to the Big East regular season title (before a very disappointing post season). Johnson would earn recognition for his effort as a 2nd Team All Big East player. As a senior, Johnson would be the team captain, and the lone scholarship senior on the team. He would become the main offensive weapon on the team, and would team with freshman Lawrence Moten to form a very potent scoring combination. Johnson would lead the team in scoring and rebounding, as he led the team to the Big East Tournament Championship. Johnson would once again lead the team in three point shooting, and had developed into a solid free throw shooter. He would earn first team All Big East honors. NBA scouts took notice and Johnson was drafted in the first round of the 1992 NBA draft by the Portland Trailblazers with the 26th overall pick. He would struggle in the NBA, playing only two seasons, 1993 with the Trailblazers, and 1994 with the Chicago Bulls.